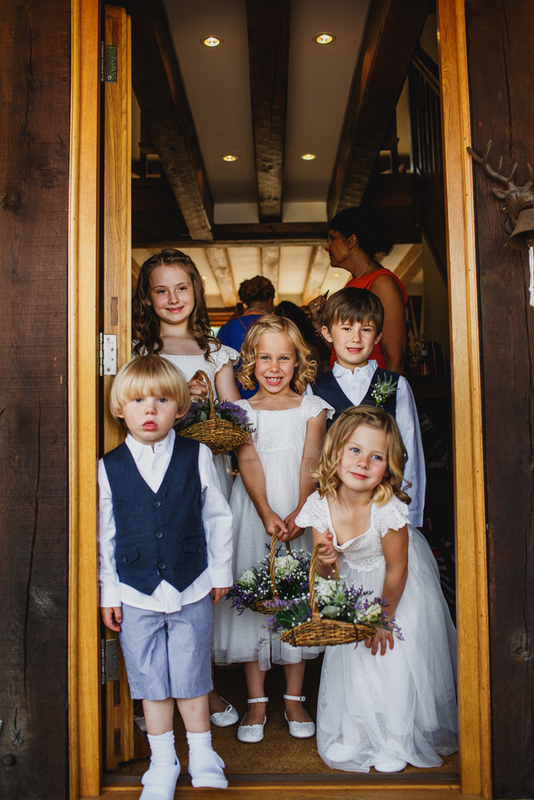 Decisions don’t come much more significant ­­­­­­­­­­than this, so you will need to give the notion of inviting children to your big day, lots of thought. Obviously, this will be an easier verdict if you have offspring of your own; And if your nearest and dearest are also attending, your kids will have someone to entertain them while you are able to do the grown-up thing of getting hitched without getting side tracked… But inviting the kids of your friends is another matter. Screaming babies at the ceremony, tantrums at the lunch and kids’ bedtimes should be a big consideration and well and truly on your radar. Once you have decided, be very clear on your invitations about whether you want your special day to have youngsters there or not. Don’t be afraid to state no kids if that’s what you want. And if you think that will offend particular guests, pick up the phone and explain why. Children will get bored without interaction, and that’s a fact. So, if you do think that you would like seven year old cousin Arabella to be one of your bridesmaids as she looks cute in peach, she will need lots of entertaining after her catwalk debut. Ditto to any youngsters who come along for the wedding meal. It’s all well and good providing kids’ options, but without any adult supervision, keeping young ones still for any period of time could be the start of a slowly burning firework! 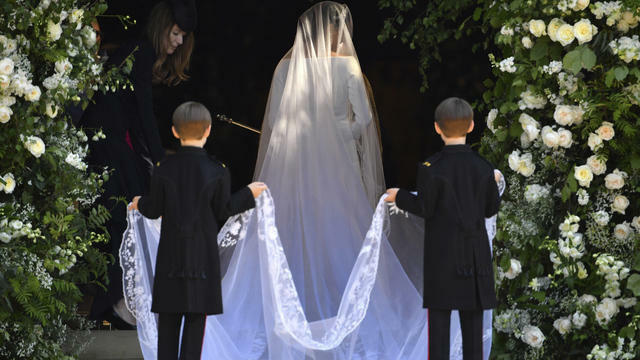 Take into consideration the running order of your day- are you going to have a separate ceremony with bridesmaids, groomsmen, flower girls etc? Will having small adults enhance you (and your guest’s) day or will they be more of a hindrance? Bear in mind it is your choice whether you just want them to come to the ceremony, or reception or neither. However, keeping kids entertained all day is something you need to factor in- bags of sweeties, and chores like distributing confetti or wedding favours, or getting them to sign the guest book, will keep them focussed for a while and make them feel important. Most teenagers will be happy with a Switch, mobile phone or other mobile games app and be able to amuse themselves on Snapchat or Instastories for the duration; However, smaller kids will need more hands-on games, pencils or books. Don’t give them any markers or paints though- little messy fingers and wedding gowns are a lethal combo! If your wedding entourage consists of a mixture of teenagers and small children. Do not, I repeat do not, bung them on the kids table! Teenagers are moody creatures, and if pushed, can hold a conversation with the adults, but under no circumstances want to be associated with tweens or younger. 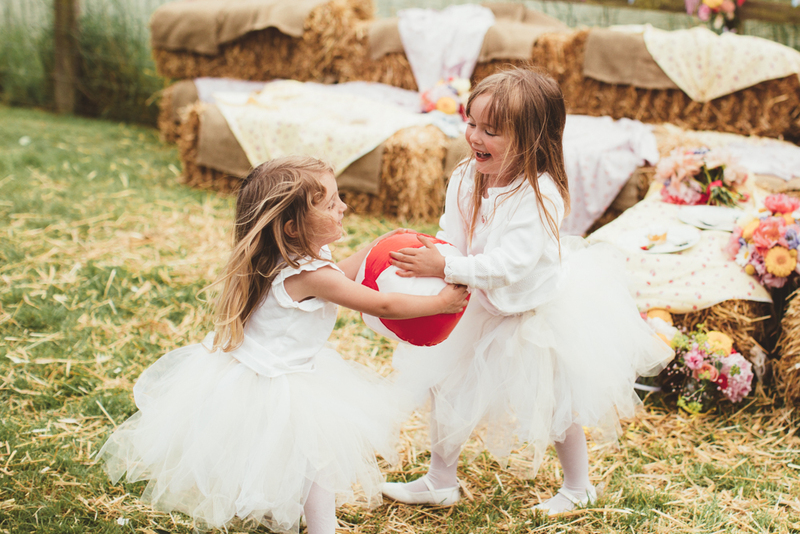 Under-tens should bond over the long wedding speeches on a kid’s fun area, where they can make some noise if they want to! 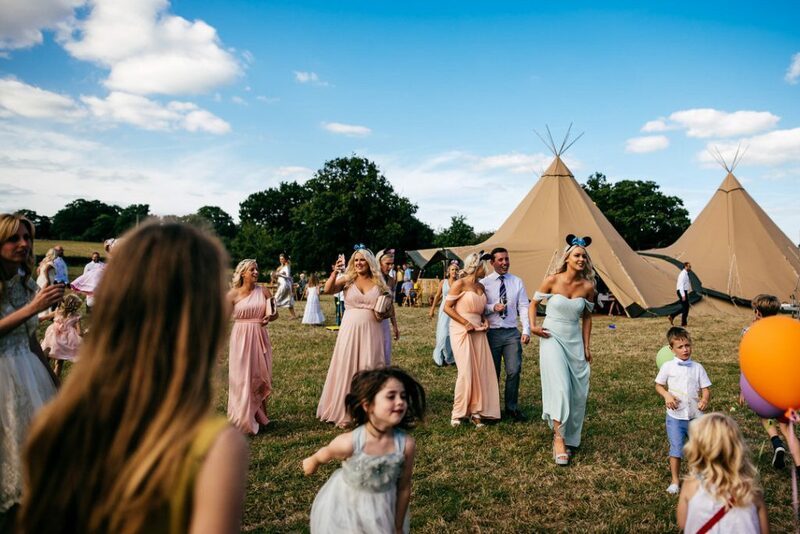 If you’re planning a tipi wedding, our structures are great for all ages! 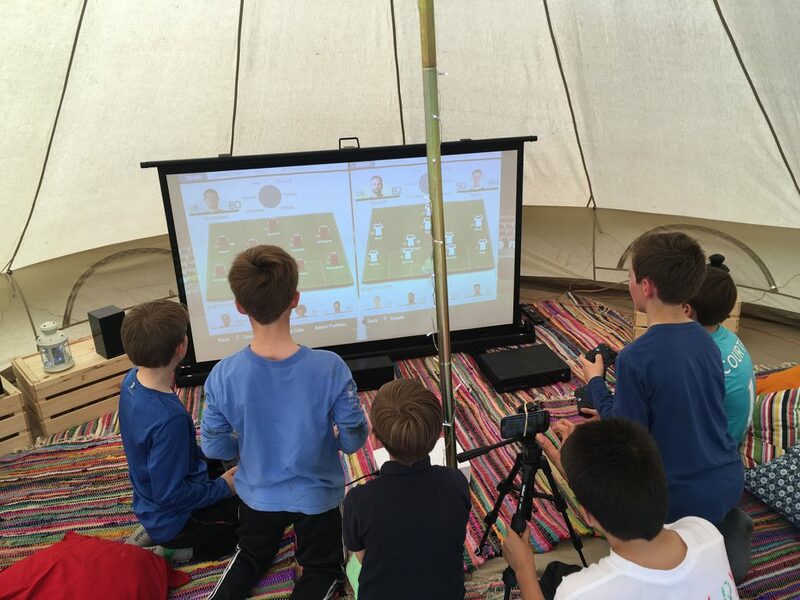 Our Cirrus tent is a perfect addition for the kids to sit down for dinner and can be stashed full of play things, TV screen or computer games and can be manned by a babysitter/nanny. It’s attached to the main tent but can be isolated, so the small ones can make some noise. With its own entrance it is the perfect place for children who can’t sit still for very long! Most kids will love the idea of a party in a field, and if this is accompanied with camping, that will be the icing on the cake! 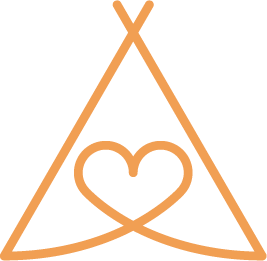 Our friends at Bumble Bell can provide special Kids Bell Tents, which have everything that the adults get but in junior sizes. Enlist some of the teenagers to be on field duty, and they can have their own little festival, whilst the adults amuse themselves at the after party. There are no losers if you choose to get married in a field. Kids or no kids, there is room for all. 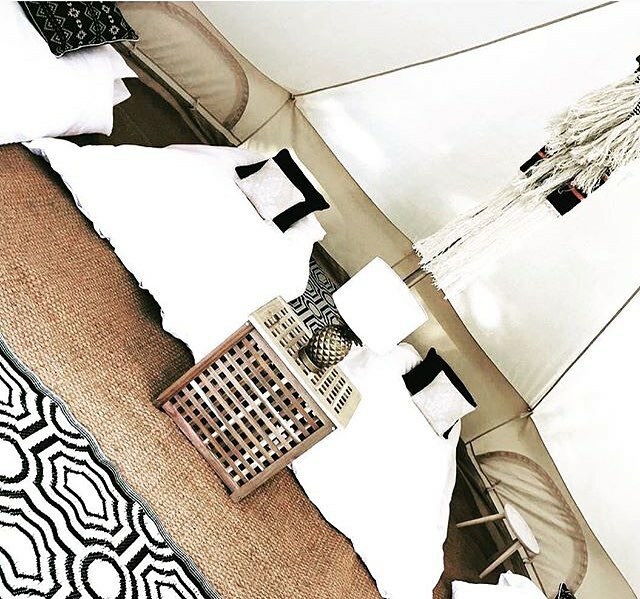 Check out Bumble Bell for great glamping ideas for the whole family.